Kara Reeder vs. Erin Webb: Coming in the ring with a 5-10lb and reach disadvantage, Erin Webb, out of POW Kickboxing in Chicago dominated a 3 round Amateur Muay Thai fight against Kara Reeder out of Hay Craft Muay Thai. 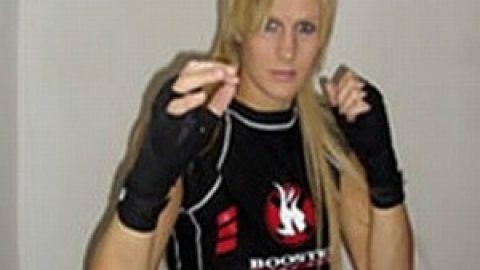 Coming into the first round, Webb came after her opponent’s leg laying some hard kicks and knees followed by her fist combo’s coming from over and under her opponents attempted throws. Kara layed in a good punch, stunning Webb, but Webb came right back stunning her opponent, knocking her down. Reeders reach advantage didn’t seem to hold Webb back from dominating the first round. Both girls layed into it in the second round, going back and forth with some great combos using a lot of knees and Reeder going for low kicks to Webb’s lead leg. Webb kept her composure and came back with an uppercut and hard knee to Reeder’s lead leg, which appeared to start taking a purple tone from Webb’s attacks. The third round pushed the two to their limits as they clinched and kneed until they had to be separated. Reeder threw another combo as Webb took advantage of another opening to kick. Reeder grabbed Webb’s leg as Webb countered and knocked her opponent down in the last few seconds of the third round. After retrieving the scores from the judges and a long night of split decisions. Webb’s great technique and performance proved unanimously, scored 29-28 from all three judges, that she had won her fight making her Muay Thai record 6-3. Rosary Califano – Too Tough to Fight?